We've had our bouts with the comical parts of Japanese smartphone culture a couple of times before, where we mostly dealt with its penchant for outlandish iPhone cases. This time, we're cruising for something even crazier. In Japan, you can buy the kinds of smartphone gadgets and accessories that boggle the mind! A robotic touchscreen cleaner? Check. Thumb extender for large phablet screens? Betcha! A cushion for your tablet's precious bottom? Mhm. We have that, and several more pieces of mobile-related Japanese arts and crafts that walk the blurry lines between awkward, weird, and awesome. If you don't believe you can actually buy this stuff, we've included links so you can see with your very eyes that these things do exist and are up for sell to anyone interested. It's not like we're joking around or something! Now, check out the 10 amazing creations of Japanese visionaries below. Which one's your favorite? Over here, we still can't get enough of the giant isopod! "Dude, is that a shower head you have on your iPhone?" "This is my cabled Japanese iPhone speaker you're speaking of, sir!" Not old enough to bear arms? This case transforms your petite iPhone 5s in a big ol' handgun, complete with an app for pistol sounds. The five year-olds in us are gleeing with joy! To look especially threatening, make sure to get the pink version. That one is real gangsta. What suspiciously looks like lip gloss for your touchscreen is actually a cleaning formula stored in a compact, pen-like tool. Smear it on your touchscreen, leave it to dry for two hours, wipe with a towel, and you're set with up to a month's worth of protection. We don't know what this stuff contains, but it probably makes your touchscreen a more hygienic place. Smartphones keep growing, but our fingers stay the same size. Such are the ills of modern man. The solution? Human augmentation! To make your life with a phablet easier, the Japanese would love to sell you this fantastic thumb extender. Stick it on your finger and get to the farthest reaches of your screen, while sticking out in the crowd with literal sore thumb. But, if that's what it takes to enjoy your phablet, so be it, right? How can you say you truly love your tablet if you haven't even bought it a cushion yet? Hurry, get the Mogu Stand! It's full of magical squishy powder beans that keep your beloved fondleslab steady in one position. In fact, your tab probably feels better on it than your head does on your swanky orthopedic pillow. Wireless charging would have been a nice addition, but we all know the technology doesn't fare well with tablets and their big, juicy batteries. The Bathynomus giganteus, the majestic creature of the deep sea! 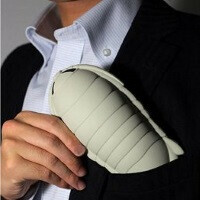 Also known as a "giant isopod", the Japanese worship it to the extent of turning it into a keychain, an over-sized stuffed toy, and a cushioning case for your iPhone that's actually more protective than Spigen or Otterbox's mini armored tank suits. Unfortunately, you won't be able to use the rear camera, and fitting the oceanborn fella in your pocket won't be easy. But do we care? Err, no. We want one! Secure this holder under the pillow, mount your smartphone or tablet on it, and descend into eternal technological bliss. We recommend all readers of PhoneArena purchase this wonderful accessory so they can enjoy our website forever, without ever having to get out of bed and distract themselves with mundane human necessities! Just make sure to replace the iPad every two years or so, lest it becomes outdated. Humor aside, this can be very useful for people rendered immobile by an accident. This is the single best smartphone and tablet stand holder our geeky eyes have ever seen. The robot is made of 200 individual nuts and bolts that you have to assemble all by yourself. The stand is adjustable and is able to hold up to 500 grams of techy goodness. What an awesome robot! Hopefully, the Japanese will develop a kaiju monster tablet holder to keep our metallic friend company. We get it. Why play pet simulators when your smartphone can be part of an actual pet? The SmartPet looks and behaves like an impossibly cute robotic dog that got an iPhone head transplant. But what does it do? Well, it definitely doesn't turn Siri into a canine! For the most part, it plays games with you, listens to voice commands, asks for food, and up to a hundred other things. You can even put another iDog next to it and the two will communicate over Bluetooth. What joy! The much smart very doge is powered by three AA batteries and is compatible with iPhones 3GS to 4S, iPad 2 to 3. Robot vacuum cleaners have been a thing for so long that having a robot touchscreen cleaner totally makes sense now... wait, no it doesn't it! Yes, it does - in Japan! Plop the little fella on your smartphone or tablet and give it a few minutes to scrub and polish the glass surface all by itself. That's the world's smallest robot cleaner for you! The gizmo runs on a single AA battery and comes bundled with five pieces of "cleaning paper". really? But I like that stand for using the phone while in bed. Good for watching movies by the way. Japan is weird. Can I get a warm milk from the vending machine, please? The robot stand is great. Kaiju and Gundam Wing stand and I'll buy it.